It’s taken seven painful years. It’s cost £776 million of our money. It has overhead cables, it has wheels, fancy livery and still goes slower than the airport bus. It probably should come equipped with a drum roll and trumpet fanfare, but instead it has a bell. And yes, finally, almost unbelievably, it’s almost here. The fun starts in May, when the first city trams will glide along Edinburgh streets with real, live, paying passengers on board, some of whom might even think it’s all been worth it. As they trundle between airport and city centre – perhaps contemplating how the bus could have got them there eight minutes faster – there will be oodles of time to reflect on just what a monumental project it’s all been. Certainly there can be few construction projects to rival the mayhem and misery brought by trying to resurrect a transport system originally abandoned as being outdated. From the torture it inflicted on traders – especially those who suffered months of disruption only to find that they don’t even have a tram outside to show for it – to the squabbles between contractors and councillors; from the rising, eye-watering bill to the rip-it-up-start-again mayhem caused by the wrong materials being used, Edinburgh’s trams are truly in a world of their own. Indeed, place the entire project alongside some of the globe’s most stunning feats of engineering and construction – designed on old-fashioned paper, built without fancy technology, taken from start to finish with less fuss, drama and meltdowns than your average council meeting – and the scale of Edinburgh’s trams debacle becomes even clearer. So, while you prepare yourself for the ride of your life on board the nation’s most expensive, most time-consuming and certainly most controversial mode of public transport imaginable, let’s pause to reflect first on just where this modern engineering miracle stands in the global pool of incredible structures. Our very own miracle of engineering, as beautiful as she is practical. The Forth Bridge stretches 1.6 miles across the estuary linking Lothian and Fife, its rail tracks 46m above the water. Of course, it did not come without a hefty price – more than 60 men died during construction. Work started in 1882 with the construction of steel fabrication workshops and in February 1883 the bridge’s foundations were laid. The final rivets were in place by December 1889 and the first test crossings took place just a few weeks later. It cost around £3.2m at the time to build. A dazzling monument to love, the stunning white marble mausoleum is an artistic masterpiece constructed on the orders of Mughal emperor Shah Jahan for his late wife. She had died in childbirth in 1631. By 1632, thousands of craftsmen and artists had been put to work creating the ultimate monument with its 35m high dome, and 40m tall minarets. Sixteen years later, the main mausoleum was finished. Within another five years the surrounding buildings and landscaped gardens were complete. Not exactly an overnight job, yet impressive when you consider it took 20 months to construct a tram line from Haymarket to Shandwick Place. For visitors to New York, the Empire State Building is a “must do” on their list of attractions. Standing 103 storeys high – 433.2m including its needle-like spire – the Manhattan skyscraper was the tallest building in the world at the time and the first to boast more than 100 floors when it opened on May 31, 1931. Yet despite its mammoth scale and the challenges of making a building rise 1454ft from the ground, it took only 13 months to construct. Incredibly, architects drew up the building plans – using good old-fashioned pen, paper and brainpower – in just two weeks. On completion, the Empire State Building stood taller than its iconic neighbour, the Chrysler Building, which had opened a year earlier having taken only two years to build. The largest ship afloat in her day, RMS Titanic was 52,000 tonnes and 882ft long of luxury and engineering skill when Harland and Wolff in Belfast laid down her hull in March 1909. Just 26 months later, the work was done. RMS Titanic was launched on May 31, 1911, only to sail, sadly, straight into tragedy. Truth be told, the Channel Tunnel – or Eurotunnel – was almost the tram project of its day, but then it did involve the agreement of two countries, a 31-mile stretch from Folkestone to Calais – four times longer than the tram line – and 23.5 miles of that deep under water. Talk of the tunnel linking England and France dates back to 1802 – even the trams can’t beat that. But once the modern idea took hold, the work rattled on, starting in 1988 and finishing in May 1994. That’s just six years for what is without doubt one of the most impressive modern-day feats of engineering. The idea of constructing a bridge to connect San Francisco with Marin County was originally considered something of a pipe dream. But a young engineer took up the challenge – and not only delivered a breathtaking structure, but did it cheaper than had been thought possible. The city’s engineer had estimated the bridge would cost $100m – too much to be considered practical. However, engineer Joseph Strauss countered that argument with a suggestion he could build a bridge for a mere $17m. That was slightly ambitious – perhaps not unlike the trams – and the final bill crept up, eventually costing $37m plus a further $39m in interest, still less than originally thought. Work started in January 1933. The longest suspension span bridge in the world at the time opened in May 1937 after just four years of construction. The photographs never seem to do it justice. But stand alongside the Eiffel Tower in Paris and the scale and beauty of this landmark iron lattice tribute to engineering and technology and it becomes all the more remarkable to think that it was completed in just under three years. Work began in 1887 with a view to it being finished in time to celebrate the 1889 World Fair in Paris – unlike the stop-start-stop timescale of the trams project, failing to meet that deadline was never an option. Gustave Eiffel and his engineers had to create a structure that not only looked stunning, but could withstand wind forces – the result is a tower that sways only a couple of inches in the strongest gales. It cost around 7.4m francs at the time – around £260,000. Standing at 324m tall, it was for many years the highest lattice tower in the world. That title now goes to the Tokyo Skytree at 634m high. It was started in July 2008 and completed in February 2012. Some love it, others hate it. Sound familiar? The Shard, opened in July 2012, dominates the London skyline, an 87-storey high shimmering tower of glass that is the tallest structure in the capital. Some 312m tall, it was constructed with energy efficiency at the top of the agenda, and includes offices, restaurants and even a hotel within its glass walls. Cost? £435m. That’s £341m less than the trams. The idea of resurrecting Edinburgh’s tram system emerged in the 1990s and plans were unveiled in 1999 for a system that would take in Princes Street, Leith Walk and Newhaven. Another plan in 2001 suggested three tram lines, a circular northern route and lines to Newbridge and Newcraighall. After more debate, that was crunched into a single line from the airport to Leith with a £498m price tag. Work started in July 2007. 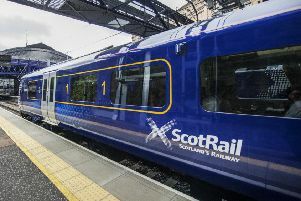 Delays and problems, rows and disputes, dogged construction, and eventually the route shrank once more, from Edinburgh Airport to York Place, a journey that’s expected to take passengers around 35 minutes. The trams are now due to open for business in May – seven years on from the first hole being dug. The price tag has been put at £776m.